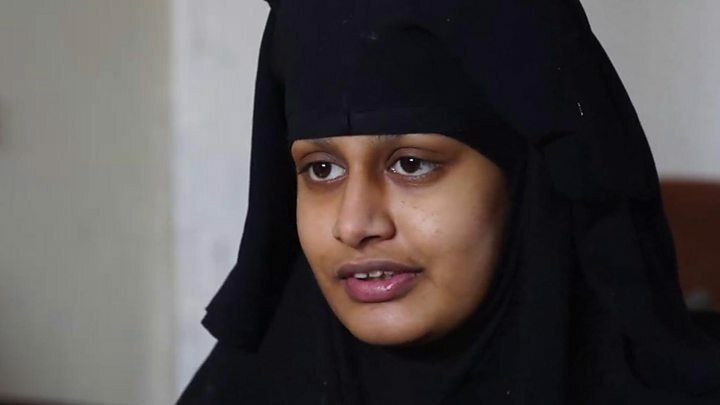 Shamima Begum, who joined the Islamic State group in Syria aged 15, is to lose her UK citizenship. Whitehall sources said it was possible to strip the 19-year-old of British nationality as she was eligible for citizenship of another country. Her family’s lawyer, Tasnime Akunjee, said they were “disappointed” with the decision and were considering “all legal avenues” to challenge it. Ms Begum, who left east London in 2015, had said she wanted to return home. She was found in a Syrian refugee camp last week after reportedly leaving Baghuz, IS’s last stronghold, and gave birth to a son at the weekend. In an interview with the BBC on Monday, Ms Begum said she never sought to be an IS “poster girl” following her journey to Syria with two school friends from Bethnal Green, and wished to raise her son in the UK. ITV News said Ms Begum’s mother had received a letter from the Home Office on Tuesday. The letter said Home Secretary Sajid Javid had taken the decision to remove her daughter’s British citizenship and the order to do so had subsequently been made. It asked her mother to let Ms Begum know of the decision and inform her she has a right to appeal. Ms Begum said she travelled to Syria with her sister’s UK passport but it was taken from her when she crossed the border. She is believed to be of Bangladeshi heritage but when asked by the BBC, she said did not have a Bangladesh passport and had never been to the country. A Home Office spokesman said while he could not discuss individual cases, “we don’t leave people stateless”. Mr Javid told MPs he would not “hesitate to prevent” the return of Britons who travelled to Syria to join IS. He said more than 100 dual nationals have already lost their UK citizenship after travelling in support of terrorist groups. Last year, two British men, accused of being members of an IS cell dubbed “The Beatles” were stripped of their citizenship after being captured in Syria. Ms Begum has said she does not regret travelling to Syria and was partly inspired by videos of fighters beheading hostages, as well as by videos showing “the good life” under IS. However, she said she did not agree with everything the group had done. “I actually do support some British values and I am willing to go back to the UK and settle back again and rehabilitate and that stuff,” she told the BBC. She admitted she was “shocked” by the 2017 Manchester Arena attack, which killed 22 people and was claimed by IS. “I do feel that is wrong. Innocent people did get killed,” she said. But she also compared the attack to military assaults on Syria, saying: “It’s one thing to kill a soldier, it’s fine, it’s self-defence. “But to kill people like women and children just like the women and children in Baghuz who are being killed right now unjustly by the bombings – it’s a two-way thing really because women and children are being killed back in the Islamic State right now. Robbie Potter, who was seriously injured in the attack while he waited for his children in the foyer of Manchester Arena, said he felt “angry” and sickened by Ms Begum’s comments. “People have lost their kids, their family members. How must they feel seeing this, that we would even consider bringing someone else back? Ms Begum left the UK with two other school friends, Kadiza Sultana and Amira Abase in February 2015. Ms Sultana is thought to have died when a house was blown up, and the fate of Ms Abase is unknown. Ms Begum gave birth to a baby boy last weekend, having previously lost two children. Her husband, a Dutch convert to Islam, is thought to have surrendered to a group of Syrian fighters about two weeks ago.